A modern British jewellery brand with 30 year’s heritage, Dinny Hall is the creative force behind her eponymous line. Dinny came to prominence when her entire Central Saint Martin's College of Art and Design graduation collection was bought by luxury department store Liberty, London. A year later, in 1985, the brand was founded and was an instant success with its experimental pieces made from unique natural materials such as leather and wood. The subsequent years have seen Dinny Hall’s jewellery continue to adapt with trends while maintaining the same quality and flair that brought her success originally. She says of her work: "At first I played with scale, exoticism and fashion statement but as time went on the actual craft began to interest me more. I began paring down the forms to be simple but as perfect as I could make them. Jewellery is a very personal thing and should not take over the wearer but be part of them". From sketch to store, Dinny is personally involved in every one of her pieces.  It’s this hands on approach that has made Dinny Hall a recognisable jewellery name around the world, synonymous with British style and quality. From concept to creation, Dinny celebrates the craft of jewellery-making. Her distinct designs have made the brand a name in the fashion world and her attention to detail has made the pieces must have luxury items for the modern woman. Created by Dinny and her team in the Notting Hill studio in London, Dinny is famous for her imaginative use of luxury Sterling Silver, 22k Gold Vermeil, 14k, and 18ct gold and many coloured gemstones..
Dinny Hall jewelry is skillfully crafted to maximize comfort and style. Dinny and her team oversee the entire production process of the pieces, from hand-drawing the designs to creating wax models used to make the jewellery masters, to hand selecting every gemstone. The pieces are created using the tools and techniques that craftsmen have used for centuries along with some of the latest computer technology to make original masters that are then formed into finished pieces by master goldsmiths trained by Dinny herself. From sketch to store, Dinny is personally involved in every one of her pieces. It's this hands on approach that has made Dinny Hall a recognisable jewellery name around the world, synonymous with British style and quality. Dinny uses only genuine gemstones carefully chosen from responsible sources who we trust together with the highest quality solid sterling silver, 14k and 18k gold. Dinny believes in crafting and engineering those metals and in this respect is a genuine artisan. Every aspect of a piece is taken into consideration, with particular attention paid to how the jewellery will feel and sit on the wearer. We create high quality products, paying respect to the materials that go into making them. All Dinny Hall diamonds are sourced through suppliers that adhere to the Kimberley Process preventing the distribution of conflict diamonds, and are in compliance with United Nations resolutions. At Dinny Hall we are committed to responsible sourcing ensuring we achieve the highest ethical standards in human rights, labour rights, environmental impact and mining practices within the jewellery supply chain.